For a long while, 2011's Arab Spring uprisings seemed to bypass Morocco. No longer. The news today shows a pattern familiar to what happened in Tunesia and is still happening in many other countries in North Africa and the Middle East. Moroccan protesters have held another rally in the country's largest city, Casablanca, to demand the downfall of the government. The rally was sparked by the self-immolation of five unemployed Moroccans outside an Education Ministry compound in Rabat earlier this month. Morocco has long been a music hotspot, if not a political one. The hypnotic music of the Gnawa people is compelling on its own, and has been made even more accessible through the modern arrangements of artists such as Hassan Hakmoun and Gnawa Diffusion. This new Rough Guide includes both traditional and cutting edge sounds. On the modern side, there's the insistent electronica of Amira Saqati and the fantastic hip hop beats of Fnaïre. More traditional are tracks from Les Imazighen and Samy Elmaghribi. 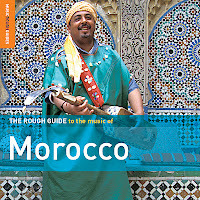 The rich liner notes explain that this compilation is intended as the soundtrack to contemporary Morocco. Not the Morocco of medieval souks and clattering silversmiths, of sumptuous Ryads with topaz swimming pools or picturesque Kasbahs high in the clean silvery air of the Atlas Mountains. No. This was the Morocco of the daily grind; the Morocco that has driven thousands of its own young into self-imposed exile in Europe and North America; the Morocco where youthful joy is proscribed by the dogma of imams and moral guardians, where corruption, unemployment and poverty are endemic, where Everyman and Everywoman has little chance against the power of the makhzen – the ruling elite who snuggle up against the walls of King’s Palace and caress the strings of power in their sumptuously ringed fingers. It’s the ambitious unsentimental Morocco of shopping malls and supermarkets, of cybercafés and nightclubs, of flirting on beaches, cruising in cars, of silicon dreams and loud urban music. As with the best compilations, this one contains music from familiar as well as unfamiliar artists, leading to near areas of musical exploration. The liner notes and artist biographies help point you in the right directions. Right then, a sample for you. The group Mazagan was formed in 1998 by three friends – Younes Ramzi, Issam Kamal and Abdelhak Amal – and they play music they call chaabi-groove. I don't know what the lyrics are about, but I think you'll agree that it is groovy. And the now-expected bonus CD accompanying this collection brings you eleven more tracks from Groupe Mazagan, if you like this one, you'll want to collect the whole set!